Open worship, free of fear, is something that Christians can often take for granted, but it is a freedom many Persian-speaking Christians in countries such as Iran, Afghanistan and Tajikistan, cannot currently enjoy. If you belong to a congregation you will probably go to church and won’t be nervously looking around to check who might be watching. During the service you will take part in praise and worship. You might raise your hands, if so inclined, and your voice too, as you are led by musicians playing a variety of instruments. Most won’t worry that a neighbour may hear and report you to the authorities. There is no risk you may end up in prison for years, or face a death sentence. Another challenge for Persian believers is that the repertoire of Persian worship material is limited, and musicians are relatively scarce. In other parts of the world, the church has had the benefit of worship music going back centuries, but the Persian-speaking church lacks this rich musical heritage. On the set of Heavenly Worship – a new series of live worship programs to enable Persian-speaking believers to engage with praise and worship in their own language. 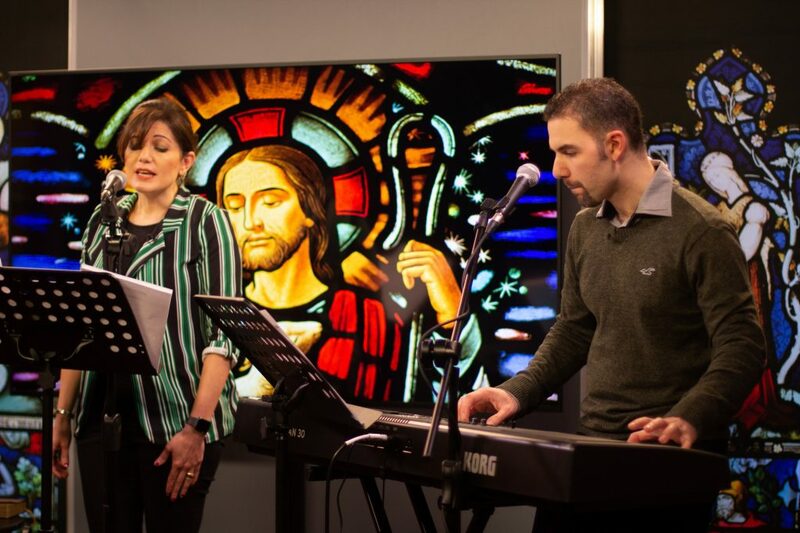 SAT-7 PARS’ weekly live show, Heavenly Worship, makes live Persian worship music accessible to isolated believers, enabling them to know that they are part of a larger church family across the globe. Our prayer for our Christian brothers and sisters everywhere is that they are freely able to worship the Lord in spirit and truth. Help SAT-7 continue to connect with persecuted believers in the Persian-speaking world. SAT-7 PARS is a 24/7 satellite television channel broadcasting a message of hope and encouragement to millions in the Persian-speaking world, with a dedicated Audience Relations team offering prayer and support to hundreds of viewers each week.